As a first generation homeschooler and someone who has only been homeschooling her kids for a couple of years, I am always on the lookout for resources and information. Sometimes I feel like I’m floating in a world where I do not necessarily know what I am doing. I feel like the more information I can take in, the more I have to choose from to figure out what works for our homeschool. 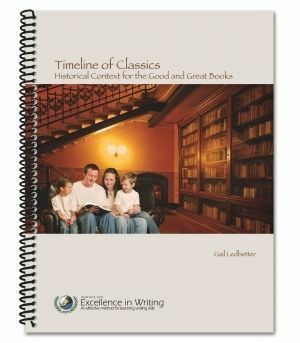 We recently got the opportunity to review a resource set from IEW that includes Timeline of Classics, Teaching with Games Set, and A Word Write Now, and it has enhanced our homeschool. IEW is a company that provides both classroom teachers and homeschool parents with materials and methods to help their students become confident thinkers and communicators. IEW offers a wide variety of products for learners of all ages and types. Everyone from the gifted student to the special needs student can benefit from materials provided by IEW. One of the first products provided in the Resource Set is the Timeline of Classics. This is a spiral bound book that includes a chronological index of classic world literature. What I like about this resource is that it includes every period of world history and then lists corresponding books, recordings, plays, etc. that go along with that period. It is arranged in an easy chart form. My oldest child is currently in first grade, so we didn’t use this resource immediately, but it is something that will stay on my shelf for when we really begin diving into world history. 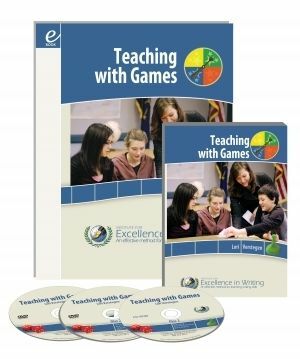 The Teaching with Games Set came with a spiral bound book, and a DVD/CD-ROM set. I have found one of the best ways to teach concepts is to use games. The spiral bound book goes into detail about the type of games you can use in your homeschool and it includes reproducible pages you can use to create your own games. One of our favorite games is The Space Game. It is a board game you create yourself from the pages provided. You make your own game cards. My son is learning to read, so I wrote simple CVC words on cards. He would draw a card, read the word, then move as many spaces as there were letters in the word, while spelling it aloud. I really enjoyed the workshop on DVD. It was helpful to see the games in action. The set also came with a CD-ROM of the book in PDF form. Appendix – Shows literary devices, prepositions, transitions, etc. I enjoyed the character traits section because it gives the definition of the word, thought about that trait, excerpts from classical literature, and then all kinds of words that can be used to describe that trait. 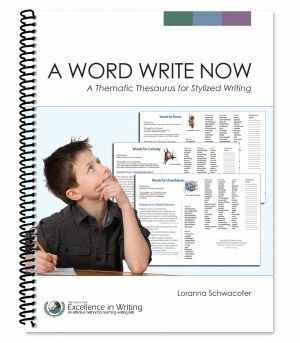 This is such an awesome resource to help budding writers.